No visit to Kent would be complete without seeing Leeds Castle. With nearly 1200 years of history, Leeds Castle has become a national treasure, and one of England’s best loved tourist attractions. Once a Norman fortress, a royal residence, a palace to King Henry VIII, this castle is open all year round. A bustling pedestrian high street offering a host of famous shops, restaurants, cafes and pubs. 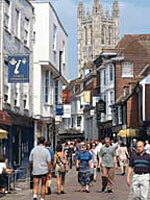 Canterbury is less than 1 mile in diameter and thus all the visitor attractions can be reached on foot. Visit the Cathedral Roman Museum with its fascinating subterranean exhibition and original mosaic floors. The Canterbury Heritage Museum traces the history of the city from Roman times to the present day. The Canterbury Tales Visitor Attraction is an exhibition where you can experience the sights, sounds and smells of Medieval England. From whichever direction you enter the city, the skyline is dominated by the cathedral. At 557 feet high it presides over Canterbury. It is the mother church of the Anglican Faith throughout the world, and has held pilgrimage status since 1170 when Thomas Beckett was martyred. The cathedral spans the centuries – the earliest part being the Romanesque Crypt circa 1100, the rebuilt Gothic Quire circa 1200 and the Nave built in the 14th and 15th centuries. See the famous stained glass windows and visit the tomb of Henry IV and the Black Prince. Kent is rightly known as the Garden of England and the area of countryside around Canterbury has been designated an area of outstanding natural beauty. Many small villages are woven into the countryside. There are many stunning places to explore whether you are walking, cycling or driving there is plenty to see from the famous gardens of Sissinghurst and Hever Castle, to the beautiful villages of Chilham and Fordwich.